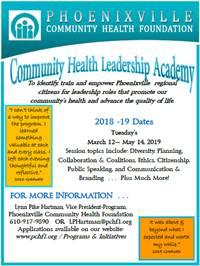 This program concept is designed to address the need for leadership training for the emerging leaders of the non-profit community within the greater Phoenixville area. In Pennsylvania 17% of the workforce are employed within the non-profit sector – approximately 962,000 workers. Recently, much has been written about the impending “brain-drain” as the Boomer generation reaches retirement age and the need to train future leaders – both in the for-profit and non-profit sectors. This leadership program will begin to identify the emerging leaders of our local non-profit community. “Most managers exhibit some leadership skills, and most leaders on occasion find themselves managing. Leadership and management are not the same thing, but they overlap.”[John W. Gardner On Leadership] The Executive Leadership Institute [the Institute] will assist these emerging leaders in understanding leadership principles and developing their own personal style of leadership. MISSION: To provide executive-level and management-level staff within the non-profit sector an opportunity to gain self awareness, knowledge and experience to become more effective leaders within their professional and personal lives. ELIGIBILTY: Executive Directors, Program Managers, and those staff identified by organizations as potential future non-profit leaders. The Institute class will be a maximum of twelve students. There will be an application process. PANO will require a non-refundable application fee of $500. Only one representative per organization is recommended. The Institute will be comprised of a ten-month curriculum, meeting monthly for four hours. Classes will include Case Study assignments and the development of an individual leadership action plan. There will also be required readings on leadership topics between each class. Each class will have two, two-hour sessions on aspects of leadership presented by individuals from the for-profit/non-profit, academic, and philanthropic sectors. The attached curriculum outlines the proposed course of study and the proposed presenter. Curriculum components will begin with a personal self-assessment through the well-recognized Myers/Briggs psychological instrument. From there students will be guided through aspects of leadership and assisted in the development of their personal leadership style as well as the practical application of leadership skills. In addition to an academic presentation, each presenter will provide a case study scenario based on their topic that students will be expected to analyze and discuss. For their final assignment, students will present their own personal leadership plans and goals. Curriculum is approved by Arcadia University as a non-credit certificate program from the School of Continuing Studies in Non-Profit Leadership. The Institute will provide students with an opportunity for self-assessment with regard to personality-style, strengths and areas for improvement. There will be a two-level evaluation of the program. Dr. John Kelley will design an evaluation mechanism for the Institute participants that will include Behavioral Outcomes and Quality of Instruction. This Evaluation, while collecting information throughout the course of the project that can be rapidly applied to continuous program improvement, will focus direct and concerted attention on the behavioral outcomes that the participants adopt to enhance their leadership. The fundamental evaluation question is: Does the program result in lasting behavioral improvements in the participant’s leadership activities? Two group sessions will be conducted by the evaluator. The first will be a half hour session immediately following the completion of class one. Its purpose will be to explain, in thorough fashion, the evaluation and solicit support and participation from the cohort. The second group session will be a focus group at the end of the final session to solicit participant perceptions and suggestions for improvement. Two written reports will be prepared and submitted to the PCHF. A report will be prepared within six weeks of the final session summarizing the post session feedback data, the focus group input and the results of the behavioral objectives. The second and final report will be submitted approximately one year after the completion of the final session and will address the long term implementation of the of Personal Leadership Plan.